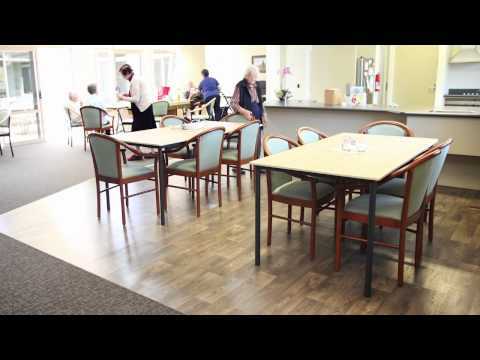 Rangiura Rest home provides hospital, rest home, and dementia support which means the performance requirements of their flooring solutions are vast. Of particular importance were the ease of care and maintenance and protection against bacteria. Shaw Ecoworx Performance Broadloom has been used in the common areas, corridors and selected bedrooms due to it's impermeable moisture barrier. Ecoworx is a high performance backing system made from non-PVC materials with low VOCs and comes with lifetime commercial warranties. Both Ecoworx backed carpet tile and broadloom contain antimicrobial properties for extra protection against bacteria concerns. The range used at Fern Haven is Graphic Nature, in the Glade pattern. Also used in the dining area and some of the bedrooms is Tarkett Traffic 250, which gives the homely aesthetic of wood-look, but as a vinyl is very easy to keep clean.